AC Joint Separation is not truly an injury to the shoulder joint. The injury actually involves the acromioclavicular joint (also called the AC joint). 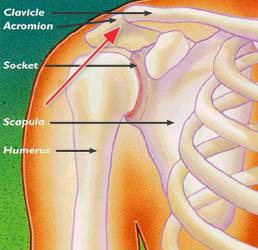 The AC joint is where the collarbone (clavicle) meets the highest point of the shoulder blade (acromion). The most common cause for a separation of the AC joint is from a fall directly onto the shoulder. The fall injures the ligaments that surround and stabilize the AC joint. If the force is severe enough, the ligaments attaching to the underside of the clavicle are torn. This causes the “separation” of the collarbone and wingbone. The wingbone actually moves downward from the weight of the arm. This creates a “bump” or bulge above the shoulder. The injury can range from a little change in configuration with mild pain, to quite deforming and very painful. Good pain-free function often returns even with a lot of deformity. The greater the deformity, the longer it takes for pain-free function to return. > A mild shoulder separation involves a sprain of the AC ligament that does not move the collarbone and looks normal on X-rays. > A more serious injury tears the AC ligament and sprains or slightly tears the coracoclavicular (CC) ligament, putting the collarbone out of alignment to some extent. > The most severe shoulder separation completely tears both the AC and CC ligaments and puts the AC joint noticeably out of position. The injury is easy to identify when it causes deformity. When there is less deformity, the location of pain and X-rays help the doctor make the diagnosis. Sometimes having the patient hold a weight in the hand can increase the deformity, which makes the injury more obvious on X-rays. Nonsurgical treatments, such as a sling, cold packs, and medications can often help manage the pain. Sometimes, a doctor may use more complicated supports to help lessen AC joint motion and lessen pain. It is often worthwhile to wait and see if reasonable function returns without surgical treatment. AC Joint Separation Surgery can be considered if pain persists or the deformity is severe. A surgeon might recommend trimming back the end of the collarbone so that it does not rub against the acromion. Where there is significant deformity, reconstructing the ligaments that attach to the underside of the collarbone is helpful. This type of surgery works well even if it is done long after the problem started. Whether treated conservatively or with surgery, the shoulder will require rehabilitation to restore and rebuild motion, strength, and flexibility.